Ibiza enjoys Mediterranean weather, with mild winters and hot summers and each season has something unique to offer visitors to the island. During July and August, the weather is both hot and sunny and there are nearly 11 hours of sun each day in Ibiza. These sunny, hot months and generally wonderful weather tend to be the peak of the tourist season in Ibiza. Fewer sunny days occur in November, December and January, when Ibiza is at its most quiet, although the island is still attractive at this time of the year, with fine, mild weather on most days. The lowest rainfall tends to be in July and the highest amount of rain falls in October, November and December. In the summer months, storms on Ibiza are quite unusual, although in the mountainous regions, the clouds may be thicker and rain more frequent than in the lower, coastal areas of Ibiza. Temperatures in Ibiza rarely fall below zero and for this reason, many people enjoy visiting Ibiza out of season. 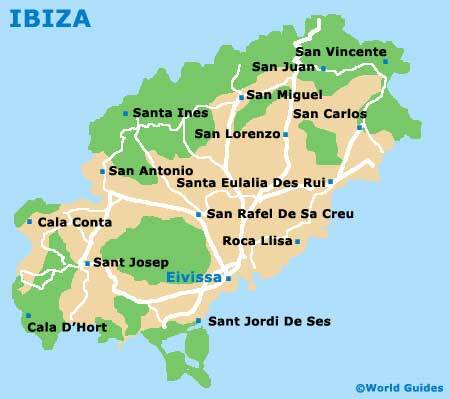 Ibiza Weather Charts - further Ibiza climate statistics and charts.